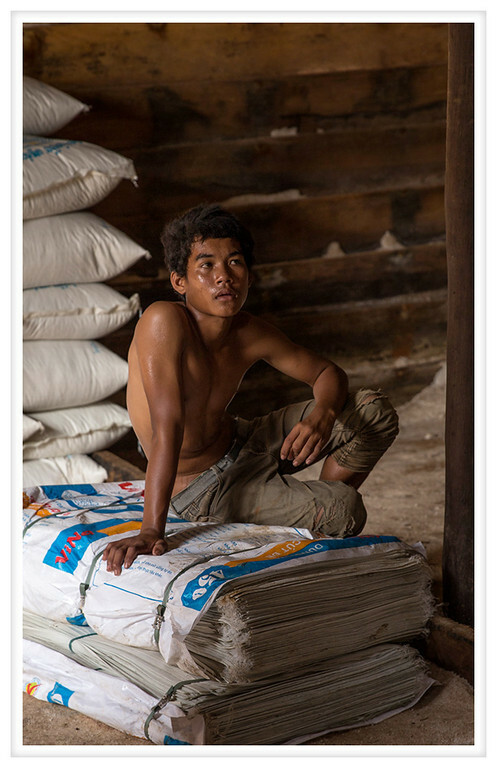 This is one of the work crew we met when we went out to the salt fields in Kampot. Near the roads adjacent to large open fields are rough wooden sheds. Each is filled to the rafters with salt and when orders are placed a crew is sent to start bagging. There were about a dozen men working when we arrived to fill what we were told was a small order; one thousand fifty kilogram bags. That is over one hundred thousand pounds and the bagging was supposed to be finished in a single day. As if that wasn't bad enough the sun was beating down on the corrugated steel roof making the shed like a sauna. It was nice to see I wasn't the only one sweating but everyone else was working a lot harder than me. All I could think as I watched the men work was that the salt must be sucking the moisture out of them and if they aren't careful they are all going to end up empty husks.